GLEN ELLYN, IL – Anima-Glen Ellyn Children’s Chorus welcomes Jamila Sabares-Klemm, currently starring as Eliza Hamilton in Hamilton Chicago, to the Glen Ellyn community on Monday, February 11th. Sabares-Klemm will lead an exciting day for choristers and the Glen Ellyn community with a variety of events at the McAninch Arts Center (MAC) 425 Fawell Blvd. on the campus of the College of DuPage. The day culminates with a special benefit concert featuring Sabares-Klemm and the Anima-Glen Ellyn Children’s Chorus. “I am absolutely thrilled to be performing for the wonderful Anima-Glen Ellyn Children’s Chorus! Growing up I was lucky enough to be a part of many different types of choirs and those experiences deepened my love for singing and performing, so I am truly honored!” says Sabares-Klemm. Singers from Anima’s Touring Chorus will receive a first-hand look at the Broadway star’s rehearsal process when Sabares-Klemm rehearses along with Anima’s beloved long-time accompanist, William Buhr, in preparation for the special concert. Following the rehearsal, Sabares-Klemm will lead a workshop on stage with Anima choristers, offering them a one-of-a-kind learning opportunity. Encore Society members, Anima’s premier giving group, are then invited to listen in to a live sound check on stage prior to the performance. “Anima is ecstatic to host Sabares-Klemm for this exciting day, offering members of the chorus and the community such a unique opportunity to interface with a rising Broadway star in our own backyard!” says Anima Artistic Director Charles Sundquist. The benefit concert, featuring a Valentine’s Day inspired theme, is open to the public and will begin at 7:30 p.m. in the MAC’s Belushi Performance Hall. A Meet and Greet with Sabares-Klemm for designated ticket holders will take place in the MAC lobby immediately following the performance and will conclude the evening. Anima-Glen Ellyn Children’s Chorus presents a benefit concert featuring Broadway star Jamila Sabares-Klemmon on Monday, February 11th at 7:30 p.m. at the McAninch Arts Center at College of DuPage. Tickets are $75 for main floor seating with access to a post-concert Meet and Greet, $50 for main floor performance only, and $35 for Balcony performance only. For tickets and information, visit: www.animasingers.org/events. 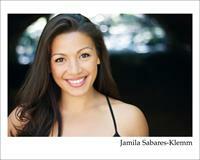 Jamila Sabares-Klemm (Jam) is a singer, dancer, actress and activist in New York City. Currently, she is playing Eliza in Hamilton at the CIBC Theatre in Chicago, IL. Born in Manila, Philippines, she spent most of her childhood there before settling in Baltimore, MD. Jamila studied classical voice at Carver Center High School for the Arts in Baltimore and graduated from Pennsylvania State University with a B.F.A. in Musical Theatre. Sabares-Klemm’s performances in National and Regional Tours include: Hair (1st National), The Prince of Egypt (TheatreWorks Silicon Valley), Rent (Bristol Riverside), Miss Saigon (Flat Rock Playhouse), The King and I (Chicago Lyric Opera), Spamalot (Farmers Alley), In The Heights (TUTS), A Christmas Carol (McCarter Theatre), Macbeth (New York Classical). Anima-Glen Ellyn Children’s Chorus is a youth choral organization, founded in 1964, internationally renowned for the quality of choral education and performance it provides. The Chorus is dedicated to transforming young lives through excellence in music education and choral singing. Anima (formerly Glen Ellyn Children’s Chorus) was the first children’s chorus in America to be recognized and funded by the National Endowment for the Arts for the professionalism of its work and captured four Grammy awards for its performances with the Chicago Symphony Orchestra under Sir Georg Solti. Its six ensembles serve children from over 35 different Chicagoland communities, with outreach programs reaching 1000 additional children annually. International tours have taken the Chorus to six continents. ANIMA (AH-nee-mah) is the Latin word for breath, life, soul, spirit. Anima’s Encore Society honors individuals dedicated to making a difference in young people’s lives through their annual gifts of $1,000 or more. Members of the Encore Society receive special access to select Anima events, such as the meet and greet with Jamila Sabares-Klemm. To become an Encore Society member or to learn more, contact Simrit Patel, Executive Director for Anima-Glen Ellyn Children’s Chorus, at: 630-858-2471 / simrit@animasingers.org.